SusieCakes bakery has been a part of so many of our family’s celebrations. They created this beautiful and delicious Vanilla Snowflake Cake for Jemma. We added the crown on top and the miniature characters (my husband’s genius idea!) which can all be found on Amazon. I love this Petite Hailey Tutu Star party dress on Jem. It’s festive but still comfy enough for playing in. You can find it in additional colors on their website. Every year, Jemma’s big brother and sister, whom she lovingly calls Bro Bro and Foo, oversee an activity to make her day extra special. This year, Bro Bro hosted the “Do You Want To Build a Snowman” table with Model Magic molding clay, while Foo spun pink and blue cotton candy for all of Jem’s pals. Well, you can imagine. When princesses come to visit, things get pretty exciting for the toddler crowd. Anna and Elsa were a huge highlight and these silly sisters couldn’t have been sweeter. 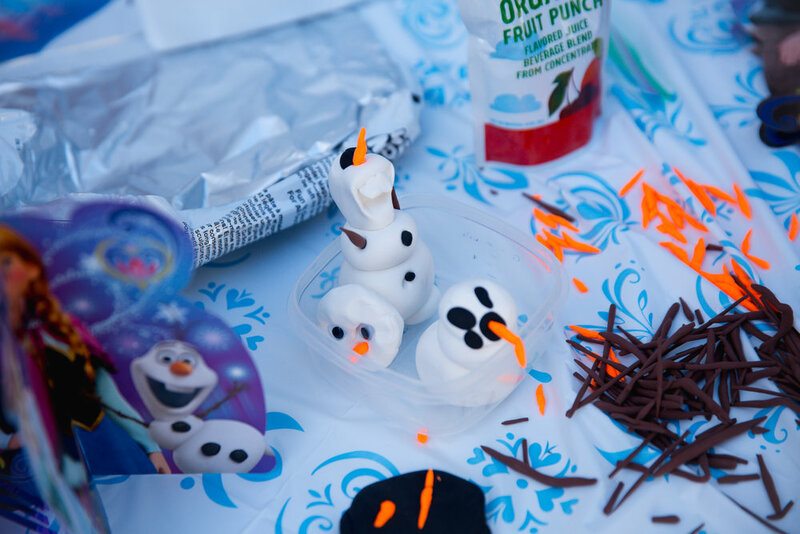 For party favors, we filled Olaf bags with these Frozen Play Packs and Jelly Belly Bags. When I look at this picture, I honestly don’t know which of us is having more fun. Watching my baby girl SO happy just melts my heart. Thank you to all our family and friends who joined us at our home to celebrate the birthday girl. And special thanks to Yanira Scalise for the beautiful photography. Shooting toddlers isn’t easy and she did such a fantastic job capturing our daughter’s wonderful day. I know most parents can relate when I ask “WHERE DID THE TIME GO?? ?” I mean, how is my Jemma a three-year-old preschooler already? Slow down already, slow down!